It’s almost a flip of a coin. Either you face Greinke’s devastating slider, or you see one of his not-so-easy “easier” pitches — the changeup, the curveball, the four-seam or the two-seam. *These classifications are not from Gameday – they’re the result of the output from clustering analysis and manual reclassification. And the strategy, although simplistic, is very effective. Greinke obviously has a plan in mind – use the fastball and the curveball to get ahead, then use the slider to finish off the batters. What is he doing to set up his slider? Here we see that, against righties, he seems throw slider after slider until he records a strikeout. Intuitively, this strategy seems to make sense. His slider is so good that he might as well keep throwing it until the batter gets himself out — a result Greinke frequently accomplishes. 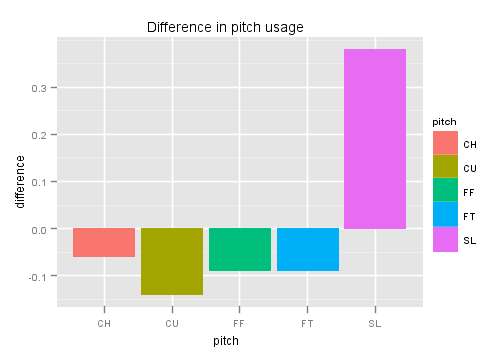 If we break down the success of his slider based on the previous pitch thrown — as measured by whiff rate (whiff/pitches) — we find that his sliders in 0-2,1-2 and 2-2 against right-handed batters are most effective when preceded by a four-seam fastball (29% whiff rate) or a slider (24% whiff rate). *The one previous pitch, not all pitches from the at-bat. Against lefties, we see that he often sets up his slider with a changeup. Interestingly, Greinke often uses his change against lefties in 0-1, 1-0, and 1-1 counts — but not very often in two-strike counts. This seems to suggest that he doesn’t see his changeup as a strikeout pitch, but more as a tool to advance an at-bat. If we look at the whiff rates for his slider based on the previous pitch thrown, we see that his sliders in favorable pitcher counts against left-handed batters are most effective when preceded by a curveball, which has an astonishing 50% whiff rate. When preceded by a four-seamer or a slider, the whiff rate on his slider is about 23%. And when the previous pitch is a changeup, his whiff rate on sliders is 22%. Much like his sliders against right-handed batters, the pitch doesn’t lose effectiveness when he throws it consecutively. While the 50% whiff rate on his sliders thrown after a curveball is very impressive, it’s also from a sample of just 10 curveball-slider sequences, so it doesn’t seem noteworthy. We hoped you liked reading Zack Greinke and Pitch Sequences by Josh Weinstock!